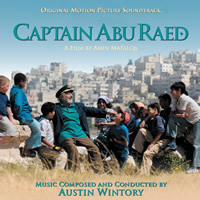 BUYSOUNDTRAX Records presents CAPTAIN ABU RAED, featuring music composed and conducted by Austin Wintory for the 2009 drama written and directed by Amin Matalqa and starring Nadim Sawalha. CAPTAIN ABU RAED is a limited edition release of 1000 units. The first 100 copies ordered through the website will include a booklet signed by composer Austin Wintory.